This book is the second iteration of the Theory of Multidimensional Reality where he was 9 years ago. This book contains both scientific and religious topics. You will learn from chapters 2 and 3 that you cannot separate the two. Mr. Vogt came to this conclusion after discovering the exact number of years between geomagnetic reversals (polar reversals) was secretly imbedded in all the dimensions given in the Torah, using a simple multiplication formula (Chapter 2). The paramount reason the author was able to discover what nobody before him was able to was because of his information theory of existence that unlocked everything including the correct model that created the original Hebrew Alphabet (Chapter 4). He developed this philosophy in 1977 and it will eventually have a profound effect on all the fields of science. 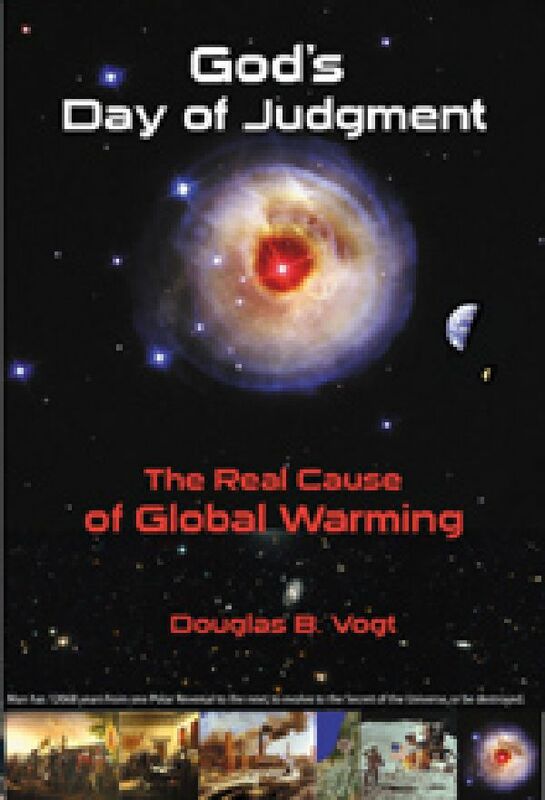 God’s Day of Judgment; The Real Cause of Global Warming is a unique book. It provides the scientific reason for the polar reversals and ice ages. It also answers the age-old religious question: What is God’s Day of Judgment and when will it happen? The thrust of Mr. Vogt’s book is to fully explain the cause of the polar reversal (geomagnetic reversal) and resulting ice age. At the time of the polar reversal, our Sun novas and that is what eventually causes the ice age. The matter theory of existence, we are currently taught, does not show or explain any connection between what happens in the center of the Earth and the center of the Sun, but the geological evidence on the Earth and Moon show there is one. The model used to explain the mysteries of the ice age and why the Sun novas at the same time as the geomagnetic reversal is called the Theory of Multidimensional Reality. This theory was first developed by Mr. Vogt between 1975 to 1977 and published in 1978. That landmark book, Reality Revealed, the Theory of Multidimensional Reality is the first information theory of existence that explains most of the phenomena in physics. The author proves that there is a very high probability the next polar reversal will happen between September and December 2046. He found the exact date encoded in the Torah. In addition, he discovered the exact number of years between polar reversals, which is 12,068 years. The Torah has this same number encoded in its text. The author explains how the Ark, the Tabernacle and the Rod of God worked and shows pictures of many of the altars he discovered during his two expeditions to the Sinai, Egypt. The reason why the book includes both religious as well as hard science subjects is because of what the author had discovered. One of his most proud discoveries is to discover the model that created the original 22-Hebrew letters. Normally you would not think this would be a major scientific discovery but it was. The original Hebrew alphabet is 22 views of a waveform that is a modified square wave superimposed on a toroid (Chapter 4). This model of a toroid is a model of how the carbon atom comes into existence as three-dimensional matter. Every single “letter” is formed when the waveform crosses the X-axis. The Torah is not what anyone thought. The 22-letters form three distinct shapes, one of them is an octahedron, which in turn forms the Star of David. This very short description does not do the subject justice. You must read Chapter 4 to understand what Mr. Vogt has discovered. He shows that the Torah is actually some kind of computer program used to program a light-based computer. The publication of this book marks the first time anyone has scientifically proven the existence of God and His relationship to the Universe. The author provides the groundwork to prove that there is some kind of intelligent design process working in the Universe. For any theory of existence to be correct, it must be able to answer the three most difficult questions in the Universe: Why was the Universe created? If God created the Universe than who created God? And what is man’s purpose in the Universe? The answers to these and other difficult questions are presented. The Problem — Why is the Earth Getting Warmer? The global warming issue has two competing scientific camps. One side claims that global warming exists and is caused by human made CO2 emissions which is heating up the atmosphere, resulting in global warming. The other camp says there is global warming but it mirrors the Suns output such as changes during the sunspot cycles. I fit into the Sun side of the argument, but both sides have no idea why the Sun’s output has been successively increasing since the 1890s. The problem with current ice age models are, they can only explain a few of the known facts that happened during these periods. Scientists do not know why they happen cyclically through time nor why only the Pleistocene period (11,000 years BP to 1.8 million years BP) exhibited repeated ice ages and ice recessions. They do not know why all ice ages are preceded with a geomagnetic polar reversal. We know there was a great mass extinction of species following the polar reversal and ice age but we don’t understand why the extinctions affect both plants and animals worldwide. The most difficult problem to explain, using the traditional models, is the creation of new species immediately after the polar reversal and ice age. There are many more phenomena the traditional models cannot explain, but that has not stopped many scientists from presenting their model (explanation) for some of these phenomena. Scientists have been trying to figure out the ice age riddle for about 100 years. It should be obvious to everyone by now that the underlining philosophy that creates their models is wrong. The problem is that egos and inertia of the academic community and their institutions prevent change. Our science is based on a matter-oriented theory of existence, which assumes that matter is the dominant driving force in the Universe. Energy and light are explained as the changes in the states of matter. All scientific models are derived from this base philosophy. If this philosophy is wrong than all models built on this basic premise will be wrong. The only other alternative to explain the workings of the Universe is an information theory of existence. This philosophy holds that Information is the dominant force in the Universe and the matter world we live in, is the product of information. The information derives from another time-space dimension. Mr. Vogt's information theory of existence is called The Theory of Multidimensional Reality and this book explains the basic philosophy in Chapter 3. The complete Chapter 3 is downloadable (see below). His first book Reality Revealed; The Theory of Multidimensional Reality (published in 1978) explains it in greater depth. This is the world’s first information theory of existence. Even Stephen Hawkins, a few years ago, corrected his earlier idea about the end of the Universe collapsing down to the size of a grapefruit, to the idea that after the collapse the Universe then goes to information. He also corrected his previous theory about black holes, which stated that when matter entered a black hole it was destroyed. His new theory is that the matter is not destroyed but goes to information. These two ideas were stated in Chapter 6, page 170 of Reality Revealed, published 1978. We will divide the ice age and polar reversal into three time periods, the first being 50 years leading up to the polar reversal and the ice age. The second, the actual polar reversal, ice accumulation and other events that occurred within 11 years of the reversal and the last period being the aftermath. The following is a condensed version. Chapter 8 has the complete explanation and all the proofs. The complete Chapter 8 PDF is downloadable (see below). The polar reversal is caused by a clock cycle that runs through time. This clock cycle crosses the x-axis every 12,068 years. Some might call this a zero-point energy event. A complete cycle would represent two polar reversals, or 24,136 years. The magnetic field of the Earth will start decaying within 50 years of the actual polar reversal, but the decay will start to exponentially decay as we get within 25 years of the reversal. The magnetic field does not have to go to zero before it snaps to a reversed polarity. As the magnetic field decays, it will create increased heat in the core of the Earth. The additional heat will rise towards the surface and manifest itself in the form of increased volcanoes and earthquakes. The increase in earthquakes is a result of the continental plates sliding more easily against each other. The increased heat of the mantel of the Earth’s, upon which the plates “float,” will become more lubricated, enabling them to move or fracture more easily. The Earth’s rotation will start slowing down in this period of time, resulting in the necessity to add seconds periodically to our clocks. Weeks, and maybe months, before the reversal the Earth’s rotation will slow down markedly, maybe resulting in 28-hour days. The Sun will also be affected by its own collapsing magnetic field. The Sun’s output will start increasing over 140 years before the final reversal. The increased solar output will start heating up the surface of the Earth. Sea surface temperatures will rise during sunspot cycles, successively increasing, as we get closer to the reversal. The polar ice caps and glaciers will start melting, resulting in ocean levels rising. Before the polar reversal, most of the ice caps and glaciers may have melted. The increased sea surface temperature will create more violent and frequent storms worldwide. The increase in solar output will create additional levels of ultraviolet light hitting the Earth. This will deplete the ozone layers in the upper atmosphere during sunspot maximum. The actual polar reversal occurs in one day. There is a complex series of events that will happen on that day. I will start with what happens to the Sun.The collapsing magnetic field deep inside the Sun will create a large spike of energy that will cause the matter and dust shell on the surface, to expand very rapidly. This event we would call a stellar nova. I estimate the speed of the dust shell to approach 1,550 miles per second. My best estimate for the energy output during the nova is no less than 2,000 times the normal energy output. The equatorial region of the Sun will blow outward along the planetary plane, hitting each planet as the dust shell expands rapidly. As the hot dust/matter shell hits each successive planet, it will push the planets a little further away from the Sun. After the nova the planets will receive a little less energy from the Sun. The planets also loose some of their atmosphere and surface liquids. Eventually, the dust/matter shell will loose enough momentum and stall out somewhere past Neptune. This is called the Kuiper belt. After the Sun’s matter shell has been expelled, it will give off mostly ultraviolet light but not much radiant heat. The Sun will remain that way until the matter shell can form around it again, and that may take a number of sunspot cycles. At the exact time of the polar reversal the Earth will stop its rotation and remain still for seven to eight hours. The forests and buildings on the Sun-side of the Earth will combust if there is not flooding in the area. Not only will heat affect plants and animals, but the Sun will produce a massive dose of cosmic and gamma rays, which will reach the Earth within 10 to 15 minutes after the reversal. This cosmic particle pulse may last 10 to 30 seconds with the potential to alter the genes/DNA of both plants and animals, including humans. The people on the Sun-side of the Earth will be able to see the Sun expanding, and the solar disk getting larger as it expands towards the Earth. I estimate the dust shell will take between 17 and 18 hours to hit the Earth. The dust shell will not necessarily hit the side of the Earth that faced the Sun, at the moment of the polar reversal, because 18 hours will have passed and another side of the Earth will be facing the Sun. When the dust shell hits us, it will deposit vast quantities of dust and rock on one-half of our Earth. It will also evaporate at least 1,000 feet of ocean water, worldwide. Some of this water will be lost into space, carried away by the expanding dust shell. Some of it will appear to us as returning comets. Most of the water will remain in the atmosphere as superheated water for several days to a week. If you could see the Earth from space, you would see it with a thick tail, pointing away from the Sun. It will be made up of dust and ice crystals. Eventually the debris tail will disappear over several hundred years, as the Earth’s gravity brings the material back into the upper atmosphere. Just after the solar dust shell passes the Earth, the Sun-side will have extremely low atmospheric pressure because the dust shell would have blown some of the atmosphere away, we just do not know how much. The backside of the Earth will temporarily have normal atmospheric pressure, but that condition will not last long. Very shortly after the dust shell passes by, the normal atmosphere on the backside, will expand very rapidly to fill up the front side (Sun-side) of the Earth. Two things will result from this process: The first will be extremely high-speed winds traveling around the Earth from all four corners of the globe, to fill up the extremely low atmospheric pressure on the Sun-side of the Earth. The second consequence of this process is revealed in Boyle’s law: If a given weight of gas is considered and if its temperature is held constant, the pressure and volume of the gas will be inversely proportional . Applying this law to the conditions that will be present on the backside of the Earth, the atmosphere will expand very fast and, therefore, the temperature will drop to extreme levels, possibly below -170 degrees Fahrenheit below zero. Any life forms caught out in the open, or even in the average building will be fast frozen almost instantly! When the Earth stops its rotation, all the water in the oceans and lakes will continue to travel in the former easterly direction at the Earths former rotational velocity. It is like walking at 5 miles-per-hour with a pan of water and you stop abruptly. The water keeps on going at 5 mph. Just before the reversal, the Earth may only be rotating at 800 mph, instead of the normal 1,000 mph (at the equator), because the rotational rate will have slowed down considerably. I would expect the wave-speed to slow down considerably after the first hour on land. Many factors will determine the speed of the wave, such as land elevation, forest ground cover, gravity and the heat blast from the Sun. Depending on how long the Earth remains at rest will determine how far this immense Ocean wave will travel across the continents. When the Earth resumes rotation it will be in the reverse direction than previous. This action will make the tidal wave appear to once again speed up, but really its because the Earth would be now rotating in the opposite direction of the wave. I believe it is not unreasonable to assume the speed of this massive tidal wave would average about 350-miles-per-hour. Within a week, this massive ocean wave will have returned to the ocean basins. As it returns, it will naturally follow the river basins leading to the sea, cutting deeper into existing deep-sea canyons. Some deep-sea canyons currently cut down to over 11,000 feet below sea level. The rotation of the Earth should resume within seven or eight hours after the reversal point, but in the opposite direction. Currently the Earth rotates from west to east. After the reversal it will rotate from east to west, so the Sun will rise in the west and set in the east. Not only are the oceans affected by the polar reversal, but also the crust of the Earth. Just as the Oceans “swim” on the crust of the Earth, the crust of the Earth “swims” on the heated-up mantle. The continental plates are also traveling at the Earth’s previous rotational velocity at the time of the reversal. They will start banging up against each other thereby causing massive earthquakes lasting for weeks of constant shaking (over eight on the Richter scale) until the plates stabilize. Mountains will be pushed up and some may sink. Volcanoes will erupt worldwide because of the increased heat in the Earth’s core and mantle, and the pressure put upon the magma chambers in the crust. The dust from many erupting volcanoes will further add particles in the atmosphere, which will help seed the dense clouds already present as a result of the massive evaporation from the nova. The lava and mud flow's from these eruptions will also further reshape the surface of the Earth. Within a day of the nova and polar reversal, it will start raining scalding hot rain, which will turn to downpours of cooler and finally cold rain. Within 10 days it should start snowing worldwide because the Sun will not be giving off enough visible light and heat to warm the Earth. It will continue to snow until all the clouds and moisture are out of the atmosphere. This process may take 11 or more years. When it is done snowing the Earth will be mostly covered with snow and thick ice in the higher latitudes and or elevations. We will then in the grips of a full ice age! The affects of the polar reversal on all forms of life, will be devastating. It is not difficult to understand why there is always a mass extinction of all types of species at the time of the polar reversal. Our job is to survive it, because the alternative is too depressing to think about. You now also understand the importance of what the author has discovered, and why God put the clues of this event within the Torah. The surface on the Moon will receive a dusting of particles and rocks from the Sun, in addition to the accumulation it has received from previous novas. There will be additional small craters from the larger molten glass lumps expelled from the Sun. Immediately after the nova, the Moon will appear red because the nova will turn the surface red-hot. Most, if not all of the Earth will get snowed on. Some areas much less than others. The Earth will be in the grips of a full ice age. It should be colder than the last ice age because we will be a little farther away from the Sun. Dense clouds will cover most of the Earth for 33 or more years until all the moisture has been rung out of it. The Glaciers will block rivers and streams and create ice dams that will be present for hundreds of years. When the dams finally collapse they will cause huge floods on the rivers effected. Eleven years after the polar reversal most of the snow and ice will have melted at the lower elevations near the equator (10-15° North and South). Animal life will start to come back in these areas. Small plants and trees will start to again appear. The oceans of the Earth will be over 600 feet below current sea level. Glaciers will be present in both Atlantic and Pacific oceans and extend down to the lower North and South Latitudes. The occurrence of frequent major earthquakes should continue for 15 years after the polar reversal until the outer mantle of the Earth cools down and the plates stabilize. If you think you are smarter than the author and think he is wrong then try to collect the $1,206.80 challange. Since 2008 no one has applied for the challange after they rad the book because they must already know he is right.